Iatrogenic illness is the medical term for doctor caused disease. Iatrogenic illness is the medical term for doctor caused disease. New research published from Johns Hopkins University school of medicine reports that it averages out at 251,454 deaths in hospitals alone from medical error in the US every year. A large part of the problem is that ICD coding does not include human and system factors as a cause of death. The result they say is that doctors don't learn from their mistakes. For fairly obvious reasons, including the threat of litigation, no doctor is likely to label a death as being due to medical error. But better, more honest reporting, they claim is the only way to understand the scale of the problem, and how to tackle it. They acknowledge that we cannot eliminate human error but with more honest reporting we can design systems to reduce iatrogenic illness. However they claim that medical mistakes has become exempt from the scientific method that we acclaim. There is nothing new about doctor caused disease. More than 2000 years ago, Hippocrates's famed advice to young physicians was, first cause no harm. The Father of Medicine was clearly concerned that his ministration could aggravate his patients' conditions. It is generally acknowledged that about a quarter of a million persons die each year in the USA as a result of iatrogenic disease. The majority of deaths are caused by adverse reactions to drugs, and infection acquired in hospitals. That's enough people to fill a moderately large city; every year. Surgery-caused disease is a real worry. Death due to unnecessary surgery is a less common cause of death in the USA, but still amounts to about 12 000 deaths per year, making a significant contribution to Iatrogenic Illness. 'Necessary' surgery of course causes far more deaths, but then many of them were going to die anyway. Not only death, of course. This received this morning in personal correspondence from the UK: Just heard a ghastly story. A lady in our church has a friend, a young mother of two, who had an operation on her back. Something went wrong and she is now paralysed from the chest down they say. They asked for prayer for her, her husband and two little children. It makes you cringe, and angry too. Iatrogenic doctor-caused disease. 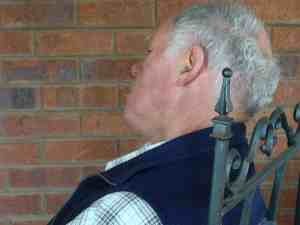 Chiropractic-caused disease is rare but it certainly occurs. Stroke (not death, please note) after a Chiropractic adjustment remains an extremely rare event, about as statistically likely as being struck on the golf course by lightning. But it does happen. More worrying are deaths from treatments by lay manipulators who have attended weekend courses, and not controlled by any professional associations. De Volkskrant, a Dutch newspaper, of 23 May 2009 reported the death of a 3 month old baby who was manipulated by a "cranio-sacral therapist." However, broken ribs, (I will admit to seven in thirty-two years in practice!) and hernias as a result of crudely-done manipulations are more common but still relatively rare. Temporary pain and stiffness after manipulation is fairly common. It rarely lasts more than a day or two. Akin to the pain after having wisdom teeth out - inevitable that there will be some after-pain. The dizzy patient is considered to be a higher risk patient for Chiropractors with about 5% reporting adverse affects from manipulation. I really have little knowledge of Orthodontics, so I tread warily in this domain. 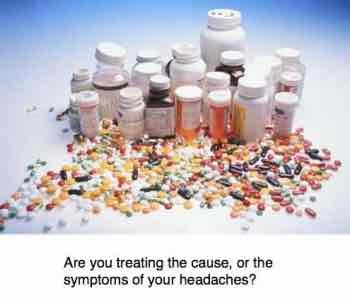 This week a paediatrician referred a young girl with severe daily headaches, of some two years duration, to me. The doctor thought the pain was coming from the teenager's neck. As she hadn't responded to two years of physiotherapy, and is taking prodigious quantities of analgesics, the doctor thought it time for a change. I could find little wrong with the girl's neck, but I always pay the TMJ a quick visit when examining the headache patient, and hit paydirt. A return to the history taking revealed that she had a bite condition that somebody thought was necessary to correct. Now she now longer has a bite problem, but she does have severe daily temporo-mandibular induced headaches that started after she began using an orthotic in the mouth. Update: Since removing the orthotic, and having Chiropractic treatment for her TMJ joint, she is now having 40% less headaches. Not really satisfactory, but she's not missing any school anymore. I am expecting further improvement. It seems to me that no health care is exempt from the dangers of Iatrogenic Illness. Orthodontic caused disease is just one other feature of iatrogenic illness. Many and perhaps most disease are diet caused. If you was prescribed by a doctor it can well be described as iatrogenic illness. For example, both the Adkins and Banting diets are high in animal protein; that's strongly associated with many cancers. Food companies have made merry with our meals. By removing fibre, fat and nutrients, and adding a host of toxic chemicals, not to mention salt and sugar, they are probably the prime cause of disease today. Refined, high glycemic foods cause an insulin rush, making us obese. Adding polyunsaturated fat to every conceivable food, they have thrown out the vital omega 6 to 3 ratio, setting up highly inflamed blood vessels, joints and muscles. We've lost the taste for foods that are unsweetened or lightly salted, or are full of fibre, like a green salad; few of us achieve the recommended minimum of five coloured foods per day; eight to ten would be far better, and not difficult to achieve. In fact, just released research reveals that those of us who eat eight coloured foods per day have a massive 35 percent lower all cause of death over a twenty year period. Now how is this for a cat amongst the pigeons? I personally consider consider that any recommendation to change to margarine and other hydrogenated foods amongst the really more serious iatrogenic illness advice that may be given; on TV, your doctor and even your chiropractor. You need a bit of chemistry background for this page, but we think it's important. 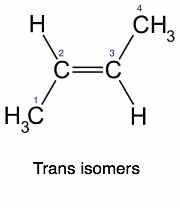 Really it's not that difficult; high school science will give you enough information to understand why margarine is not only bad because it tastes lousy, but because 50 percent of it contains a highly dangerous chemical called a trans isomer. It comes as no surprise that new research, a meta analysis of all previous research, reveals that there is not a shred of scientific evidence for changing from butter to margarine. Interesting new research, confirmed in two new studies, one from Japan and one from the Netherlands, has noticed that the serious neurological diseases like Motor Neuron Disease invariably seem to have a high carbohydrate / low fat diet in the background. This really should not come as a surprise since healthy nerves are lined with a fatty myelin sheath that becomes eroded in these diseases. There are thoughts that motor neuron disease may be another iatrogentic illness after obese patients have been put on a dangerous diet. The whole of this Chiropractic Help website is about a return to healthy living. The single most important thing any person can do, in my opinion anyway, to improve their health is to start including our Healthy Choice Foods to their diets and becoming just a little fanatic about our Healthy Living Tips ... the modern food industry has turned good healthy food into the nutritionless foods that fill our supermarkets and are the single greatest cause of poor health. Having been told by my anaethetist, five years after the event at a cocktail party, that she very nearly lost her patient (me!) during minor surgery when I was 35, Iatrogenic Illness is a subject close to my heart. "You probably don't remember me," she said, "but I'll never forget you!" Anaesthetic-caused disease is a real issue at every operation. Just this week is the tale from a reader who went in for successful lower back surgery, but the long extension of his neck for intubation has slipped a disc in his neck causing pain and tingling in arms and hands. Every chiropractor must take leave, or he'll burn out. I know, because I nearly did; but locum caused iatrogenic illness is a serious threat. Yet, it is his responsibility to ensure that the locum adheres to basic ethical chiropractic principles; and sometimes that's difficult; you end up taking anyone who is available, or fall apart at the coalface. The problem is two fold; said locum may have graduated in the bottom 5% of the class; he or she may be inept. And secondly, the practice may be so busy that the locum has little time to be cognizant of the finer details of every patient's history. Potentially it's a mine field in which things can sometimes go seriously wrong. Every chiropractor needs to read this severe pain after fill in chiro adjustment. It's a tale of woe, and frankly could happen to the best of doctors. In short, iatrogenic illness needs to be considered when taking any medication, consulting any doctor including your chiropractor and orthodontist, and even when considering what you do or don't eat. For example, doctoring yourself with high cholesterol foods will likely sooner or later cause iatrogenic illness, a heart attack or stroke. Likewise, doctoring yourself with a low-fibre diet will surely give you serious constipation with the attendant risk of bowel cancer. That's why I eat Hummus almost every day. Very simple to make in your own kitchen following this AUTHENIC HUMMUS RECIPE ... make it in only five minutes. In short, many and even most illnesses come about when we try to be the doctor; self-caused disease may be the result. Self manipulation is one of the more pernicious forms of iatrogenic illness; almost invariably it's ends up in nerve pain down one or other limb. Tingling in arms and hands, and legs too, draws the most frequent questions from readers at Chiropractic Help. Iatrogenic illness reminds us that Hippocrates' edict was first cause no harm. 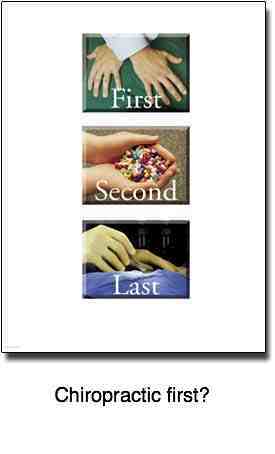 A few days after taking flu shot my left shoulder, arm, hand, thumb and index fingers went numb and tingling at night. I can't lie on my left side because of dull pain. My finger are so stiff that I can't bend them very much. I had some discomfort on the right side but very little and no numbness. It doesn't bother me during the day much. It's hard to open bottle caps etc. I have an appointment with my doctor in a couple weeks but am trying to learn as much as I can. There is no consensus as far as I know in the Chiropractic profession. Personally I believe that vaccinations are for serious diseases like polio only. I have had so many patients over the years who have become seriously ill after the flu shots. Attacks on the chiropractic profession continue to diminish; in its place, inter professional cooperation in the interests of the patient is gradually taking place. Having said that, there is still a perception that spinal manipulation is very dangerous; in the hands of the untrained layperson, or other professionals who weekend courses to learn the art of manipulation in a few days, I would agree. It's interesting that cervical manipulation by physiotherapists who attended such courses has now been banned in the Netherlands after several serious injuries. Some things are not easily forgotten; like the story told in my first book, Frog in my Throat, when a gynaecologist refused a referral from me because it would be "unethical." But that was 35 years ago now. Insurance premiums are perhaps the best independent measure of just how dangerous a particular profession is. Divide roughly by 15 to bring to dollars. Statistically, chiropractic is very safe; more than 200 times safer than some medical specialties according to the insurance companies. Nevertheless, iatrogenic illness happens regularly in our clinics too; mostly it's benign and of no great consequences but very occasionally it can be serious too. We make no boasts at Chiropractic Help because we are not treating patients with very serious life-threatening conditions; there's no place for arrogance. But our treatment is relatively safe and deaths are virtually non existent from iatrogenic illness. However, less serious iatrogenic illness certainly occurs in the chiropractic profession too. To go from Iatrogenic illness to Chiropractic management of Vertigo Dizziness ... click here. 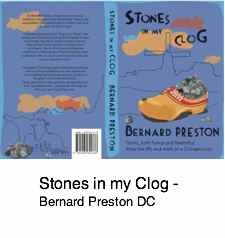 Stones in my clog is a book of anecdotes by chiropractor Bernard Preston; in his tomes are cases of iatrogenic illness that are freely acknowledged. Only $2.99 on your eReader, smartphone or tablet.